Okay, I’m just going to come out and say this. Back in August I finally experienced my “that’s it!” moment and decided I was going to do something about the butter weight I’d accumulated. I joined Weight Watchers and started losing weight. Three months later I’ve lost 19.6 pounds and am just 2.4 pounds away from my first goal — which was to lose 10% of my body weight. I wrote a little bit about changing my relationship with food back in September, and wondered if this would change mise en place. It’s been pretty quiet around here, so it apparently did. I can admit that I may have been a little embarrassed, worried about how “being on a diet” might affect my foodie cred (lame, I know). But being on Weight Watchers has also forced me to recalibrate all of the things in my life. Finding time every day to work, exercise, eat well (i.e. actually taking time to eat lunch and not just shoving a slice of pizza into my face between paragraphs), cook, shower, relax, pay attention to my partner, family and friends, and oh yeah, sleep, has been a challenge. So forgive me if after all that blogging hasn’t been high up on the priority list. Finding balance hasn’t been easy, but I think I’ve got it. My secret weapon: our new slow cooker! About a month ago I dragged Jeff out to the Bay to purchase a slow cooker. Once home in the elevator a neighbour noticed the box and lamented that our lives were about to be transformed. And boy, was she right. After a long day at work we can come home to a hot meal without lifting a finger. We’ve enjoyed chili and stew and soup and the best roast chicken I have ever had in or out of a restaurant. What are you waiting for? A slow cooker is definitely the secret to eating well on the run. 1. Rinse and pat chicken dry, removing any visible fat. Discard giblets and neck. Coat 4-quart or larger slow cooker with cooking spray. 2. Combine paprika, onion powder, garlic, salt and pepper in bowl. Stir in warm water by the teaspoonful until thick paste forms. Coat chicken inside and out with seasoned paste before placing in cooker, breast side up. 3. Cover and cook on low 6 to 7 hours (or on high 3 1/4 to 4 1/2 hours). Remove chicken from cooker. When cool enough to handle, remove skin and carve. The meat will be so tender it will just fall off the bones. Thanks, Kim. I feel like I’ve got everything in balance these days so I’m going to try my best to keep up with the blog again. And I’m not embarrassed about being on WW any more, I feel (and look!) too good to care! That’s the attitude! Anyway, WW is considered a “change in lifestyle”. One comment I would like to submit re crockpot. The challenge I have is that the meat always tends to cook in its own fat. Not sure how to change that. If you have any suggestions, please do share. 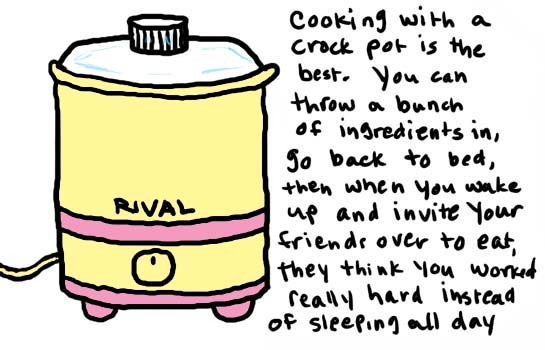 I as well love my crockpot. Hmmm, that’s probably why it tastes so good! I’m not sure how you could combat this. What about placing the meat on a rack inside your slow cooker, if it fits? That way the fat will just drain out the bottom. When do you get to come to Toronto, we need to eat together! A secret I found when slow roasting a lamb roast – place the meat on a homemade rack by rolling up a bunch of balls of aluminum foil to layer the bottom before you put in the meat — the meat is still as tender and moist as ever but you’ve got your fat down at the bottom. I was so happy to see your post, Amanda! That recipe looks delicious. I didn’t know you could do a roast chicken in a crock pot. Sounds succulent. And kudos to you for your ‘confession’- although I’m sure you’ll find that people are supportive rather than critical. We don’t mind healthy recipes as long as you keep blogging on your fantastic blog! Oh Jess, succulent it is. I don’t know if I’ve ever described chicken as a succulent meat, but the slow cooker makes it so plump and juicy. You’ve got to try it out! And then you can use the carcass to use stock: http://www.grouprecipes.com/525/slow-cooker-chicken-stock.html. And thanks for your kudos, I needed that. I’ve been so scared to be pegged as a “diet blogger” or a “weight watchers blogger”, but now I don’t care. It’s my blog and I’ll write what I want! way to go amanda!!! i love our slow cooker too so i cant wait to make the new chicken recipe!! keep up the good work!! its so neat to know that other people care about their health and love food. you can def do both!!! You should totally do it. We bought ours a month or so ago and it’s already paid for itself. We use it at least once a month. Amanda! Love that crockpot picture from nataliedee.com and this recipe sounds delish! Unfortunately my crockpot is inherited (from my Grandma, it’s very old) and it smells weird when I turn it on, so I’ve stopped using it for fear of some weird electrical malfunction since the smell is kind of… electric-y? Oh and PS I was one of the people at the recent Girl Geek Dinner, and I believe I also saw you on the Chicken Farmers of Canada panel at Edward Levesque’s Kitchen! Just thought I should drop in formally and say hello! Stacey! The next time we find ourselves in the same room you should most definitely say hello. And you know, slow cookers are so affordable these days it might be worth picking up one that doesn’t smell, electric-y! We purchased on sale at The Bay for about $60 and have used it so much in the last month or since since we picked it up that it has pretty much paid for itself. I agree! I will come say hi! Nice – Thanks for the info – I was thinking about maybe asking for one for Christmas, or for my birthday next year too – but with prices like that there might not be a need to wait, I could go out and get a non-electric-y smelly one NOW! Amands, Congrats on your weight loss. I know how challenging (and motivating) it can be to discuss this subject on your blog. Lately my eating habits have been going south. I have a slow cooker that’s been in the cupboard since last winter. You’ve inspired me to take it out and put it to good use. I hope you’ll share more of your healthy, low-fat slow cook recipes on mise en place. My family will thank you for it too. Please remind me of the name of the cookbook you mentioned at TGGD the other night. Thanks, Eden! I was pleasantly surprised how friendly and excited for me everyone was when I outed myself as a “loser” on Facebook and my blog. I’ve definitely been motivated to keep going, and to share my experiences. The book I mentioned at TGGD was Hungry Girl’s 200 Under 200. She has a great website, http://www.hungry-girl.com, and a fantastic daily newsletter with tips and tricks for eating healthy. It’s not a book I reach for daily as recipes often call for Splenda, egg substitute, baking mixes, etc. but it is a go-to when I’m looking for a recipe for a guilt-free treat. Thanks Amanda! I’ll have to check out Hungry Girl and all pass on the chemical substitutes as well.